Pratt and Whitney has told India it will provide replacement engines for grounded A320 neo aircraft operated by IndiGo and GoAir airlines by the end of September, a civil aviation ministry official said on Thursday. Eight IndiGo planes and two GoAir jets are grounded because the carriers cannot get replacement engines from Pratt and Whitney, which is owned by United Technologies. The official, asking not to be named, said the government has told the engine maker to prioritise its deliveries to India's biggest airline, IndiGo, and GoAir. I was looking at BOM on FR24 today and noticed that 6E339's (BOM-BDQ) callsign was IGO339T. Looks like the alphanumeric system has caught on here as well. IndiGo is in talks with multiple operators over plans to wet-lease in A320 capacity for the upcoming 2017/18 winter season. According to India's Business Standard, the Indian LCC is in talks with Alitalia, Air Berlin, and Small Planet Airlines for the lease of at least seven A320 aircraft. The agreements, if secured, will only cover the winter season which ends in March 2018. IndiGo may soon offer business class seats on its long-haul flights. The carrier plans to adopt a two-class configuration — with a small business class along with the economy seating. Other than business class seating, the low-cost also plans to offer unbundled products like meals, priority boarding, and check-in and seat selection to economy passengers, Business Standard (BS) reported on Thursday. "If we expand our operations to include long-haul international routes, we may have to consider full-service flights, business class seating, code-sharing arrangements," IndiGo's parent company Interglobe Aviation, said in its Draft Red Herring Prospectus (DRHP). A senior IndiGo executive told BS that the carrier even plans to lower fares by as much as 30 percent on the long-haul flights. "We will offer a small business class, along with high-density economy class, with 25-30 percent lower fares. We have a cost structure that is the lowest in the world and that will allow us to bring down the fares," he said. The carrier is likely to choose International Airline Group's (IAG) Airbus A330-200 model for its long-haul operations, the aircraft provides 314 economy class seats and 21 premium seats, sources told BS. IAG??? Does this mean Indigo is partnering with IAG? If so think they are a great match. Indigo should fly to the US via LGW and IAG can use Indigo to challenge Norwegian on LGW-US routes. 314 Y 21 J sounds more like the A330-300, not the A330-200. U less they are planning to cram the Y pax in like sardines. IndiGo has lifted the altitude restriction on its troubled A320neo fleet following advice from engine manufacturer Pratt & Whitney that it was not necessary. India's Business Standard has viewed a notification from airline management to pilots which says: "From September 1, planning of cruising flight levels will be as earlier on performance, environmental and other common factors irrespective of the engine type IAE, CFM or NEO up to Airbus limits as per flight command." IndiGo pilots were advised in May 2017 to observe a maximum altitude of 30,000 feet whenever practicable in a bid to reduce known problems with the bearings of the PW1100G geared turbofans. However, Pratt & Whitney have now advised that normal flight operations can recommence. "This recommendation was intended to address component durability related to the No 3 seal. Since March, new engines and overhauled engines have incorporated improvements that have enhanced the engine's durability," a P&W spokesperson said. Indigo has added a pre-owned A320 to the fleet today, as VT-IHC. American engine-maker Pratt & Whitney has started supplying new engines to its largest customer in the country, IndiGo, helping it put back into operations some of the grounded A320 Neo planes. The Gurgaon-based airline has taken off the ground two A320 Neos after it has received two new engines from P&W this month and more such grounded aircraft are expected to resume flying soon as it expects new engine deliveries to improve, official sources said. Recurring engine glitches have forced the airline to ground nine of its A320 Neos and cancel over 600 flights between late June and early July. The airline currently has 140 A320s, of which 23 are P&W engine-powered A320 Neos. "Pratt & Whitney (P&W) has supplied two new engines to IndiGo, following which two of its eight grounded A320 Noes have resumed flight,” a source told PTI in Mumbai. Queries sent to both IndiGo and P&W seeking confirmation on the issue remained unanswered. The largest airline had taken off nine A320 Neos from its fleet in the June quarter owing to engine issues. However, one of these planes was made operational later. As of today, only six A320 Neos are grounded, said another source in the civil aviation authority. Indigo has added a new A320NEO to the fleet today, as VT-ITX. At a time when IndiGo, India’s largest airline by market share, is facing capacity constraints due to performance glitches with the Pratt & Whitney PW1100G-JM engines equipped on its A320neo aircraft, the low-cost carrier has exercised its option to convert a part of its A320neo order with Airbus into the larger A321neo aircraft. The airline has, however, not made any changes to the engine order and its A321neos will be equipped with the same geared turbofan engines. According to the monthly data of orders and deliveries released by the French airframe manufacturer, IndiGo’s order for the 186-seater Airbus A320neo went down to 405 as of August 31 against 410 a month ago, while the order for 232-seater A321neo went up to 25 compared with 20 aircraft as on July 31. The airline expects to begin taking delivery of the A321neo aircraft “towards the end of calendar year 2018”. An IndiGo spokesperson said that the airline’s A320neo order with Airbus has the option of switching “certain number of aircraft” to A321neo, which it exercised recently. “Airbus A321neo has 232 seats, while A320neo has around 180, so the operating cost of A321neo is much lower than that of A320. There is no change in the engine order, only the number of seats will increase,” the spokesperson told The Indian Express. IndiGo’s new Airbus 320 neo planes, already afflicted by engine trouble, are said to be taking longer to fire up and get ready for take-off, adding to congestion at Delhi airport, the carrier’s main hub. The A320 neos take more time than others to taxi to the runway after being pushed back from the parking bay, according to the minutes of the airside safety committee meeting on July 26 that EThas reviewed. IndiGo denied that the A320 neos are causing delays. “Neo engine start time is not significantly different from other jet engines. Airbus 320 neo are not causing any delay or congestions at Delhi airport,” the airline spokesperson said in an email response. IndiGo is likely to debut its regional operations in South India later this year using a new seating plan on its smaller aircraft which have been approved by the aviation regulator. IndiGo—India’s biggest domestic airline, with a 140-aircraft Airbus A320 fleet—will use a 74-seater ATR turboprop where the first row seats will face each other. DGCA has cleared the 78-seater version of the same aircraft just in case another airline wants to bring the extended version later. Wow, the first three ATRs all to be based in HYD. 6E is slowly but surely pushing everyone else out of HYD. I wonder what SG's move will be now that 6E will directly compete with its Q4 routes out of HYD on three sectors. 9W is yet uncommitted on its AT7 plans. IndiGo's profit in the July-September quarter has jumped to Rs 551 crore, up almost 300% from Rs 140 crore in the same period last fiscal. The increase came on the basis of improved yields and compensation from Pratt & Whitney for the glitches on Airbus A-320 NEO engines that kept several of these planes on IndiGo's fleet grounded. The engine manufacturer has compensated IndiGo for revenue loss and expenses incurred as up to nine A-320 NEOs were grounded in Q2. As of now, the airline says no NEOs are on ground as P&W has supplied spare replacement engines. However, the entire engine trouble is expected to take 12 to 15 months to resolve. The LCC's revenue increased 27% to Rs 5,291 crore. Indigo has added a new A320NEO to the fleet today, as VT-ITY. Bookings have commenced for all flights! Why does the LKO - HYD flight take 3.5 hours, while the return takes only 2 hours and 5 mins? LKO and HYD are in the same time zone, no? Must be an error. India has only one time zone. Increased padding of block times due to fog conditions at Lucknow. In a first for Indian carriers, IndiGo will be operating 1,000 daily flights before the end of this year. It got on track to cross that milestone with the announcement of 47 new flights (19 new sectors and 28 additional flights) on Monday which will see it operating 1,000 daily flights from December 23, 2017. IndiGo president Aditya Ghosh said: "A thousand daily flights is a milestone that no airline in India has ever achieved before. As Indians we are proud to create this new record. 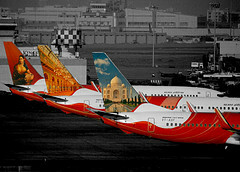 While one thousand is just a number, for us each flight represents an opportunity for millions to chase their dreams. As we approach this mark, we cannot hide our excitement and thank our over a hundred million customers who have made this journey possible!" Cool but how does this compare to other airlines? How many daily flights does JetBlue or FlyDubai operate?
" Cool but how does this compare to other airlines? How many daily flights does JetBlue or FlyDubai operate"
I wonder how much traffic they would have on these redeye flights. Usually passengers who travel at that time generally are international connecting passengers but Indigo operates from Terminal 1 and international flights use T2 in BOM. These Red Eyes add little Fixed Cost to the operation and bring in whatever extra revenue they do. Moreover 6E wants to take up whatever slots they can at BOM airport before its FULL. India’s largest domestic carrier by market share IndiGo took the delivery of first of its 50 ATR72-600 aircraft today at Toulouse. The aircraft will fly to India via multiple stops starting with Brindisi airport in Italy and Heraklion International Airport, Greece, Hurghada, Egypt followed by another one in Middle east before making it to India. The aircraft is registered VT-IYA (MSN: 1457). The airline has opted for a 74 seater version of the ATR72-600 which sees 4 seats facing each other. The manufacturer advertises the aircraft to fly upto 900 nautical miles or 1665 kilometers with full load, powered by two Pratt & Whitney 127M engines. IndiGo also took delivery of its first 186 seater A320neo which flies non-stop from Hamburg to New Delhi on its delivery flight. VT-ITZ (MSN: 7892) was test registered as D-AVVD and had its first flight on 6th November 2017. This will be the 26th A320neo in the fleet of IndiGo and the airline will have a fleet of 143 aircraft (116 A320ceo, 26 A320neo, 1 ATR72-600). A few more A320neos are expected to join in the next couple of weeks. Indigo has added a new A320NEO to the fleet today, as VT-ITZ, and an AT72-600 (its first), as VT-IYA. IndiGo in late-December 2017 plans to expand service to the Middle East, including new routes launch to Doha and Sharjah. IndiGo starting next month is introducing its new fleet type ATR72-600 to its scheduled operation, as the airline took delivery of first aircraft last week. The airline’s initial ATR72-600 operation for winter 2017/18 season from 21DEC17 as follows. Indigo has added a new A320NEO to the fleet today, as VT-IVC.